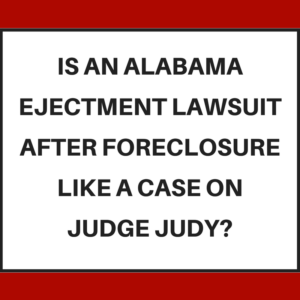 Is an Alabama ejectment lawsuit (after foreclosure) like a case on Judge Judy? We see so many Alabama consumers make this mistake and it ends in disaster and anger. Let me lay out the context and then we’ll dive right into what happens. So as an Alabama resident and homeowner you get behind. Your mortgage company threatens foreclosure. So you get a default letter and then an acceleration letter. Maybe you try loss mitigation or maybe not. Then on the actual date of the foreclosure your mortgage company forecloses. Many consumers are in a state of denial and refuse to believe this has happened. Then you get a letter telling you to vacate the premises as someone else (mortgage company, Freddie Mac, etc) now owns the property. When you don’t, you get sued for ejectment. What is an ejectment lawsuit? This is where the person or company who claims to own your house (because of a foreclosure deed) sues you to evict you. Or eject you from your home. The lawsuit is filed in circuit court — not small claims and not district court. The lawsuit is asking that you be forced out and normally that you must pay damages to the other side for staying in “their” home after the date of the foreclosure. So what does Judge Judy (or any other TV court show) have to do with an Alabama ejectment case? Here’s what people think and do. We see this time and time again. So the answer (response) to the ejectment complaint (which is due 30 days after being served) is not a proper answer. It instead is a rant about how unfair life and the mortgage companies are towards the consumer. This may be enough that the judge rules against the consumer. But if not, then the mortgage company (often represented by Sirote & Permutt out of Birmingham) will file a motion for summary judgment. So the consumer does not bother to respond in the proper time and proper manner with the correct evidence and law. Instead, the consumer files nothing or files a letter saying how unfair life is. The judge then enters a summary judgment in favor of the mortgage company or whoever sued the consumer. Sometimes there will be a delay or sometimes not but the next step is to issue the order approving the sheriff literally showing up to your house and ordering you and all of your stuff out. Immediately. This is when people tend to call us — they are angry, scared, and in disbelief. It just doesn’t seem real to them that this would happen. Nope — if you lose the summary judgment, the case is over. This lawsuit is not on a TV courtroom show. It is real life. There are very strict rules you must follow or you will lose. So don’t treat this lightly or ignore it — if you do, you will lose your home and be kicked out. Either get a lawyer that knows how to fight back or educate yourself on the law and the rules. And by the way, printing stuff off the internet or showing the judge where the mortgage company has been sued before is worthless. You have to present proper evidence in the right way at the right time or you will lose. If you are facing an ejectment lawsuit after a foreclosure in Alabama, call us immediately at 205-879-2447. You have a limited time to respond to the court lawsuit. So find out your options right now. Call us at 205-879-2447 or fill out our contact form and we’ll get right back with you. We look forward to speaking with you ASAP.